Through the years, I have invested in everything from stocks to precious metals, even making a short unsuccessful attempt at currency trading.' While a diversified portfolio is essential to mitigate risk, too many people completely overlook real estate, instead focusing on traditional securities, particularly stocks.' 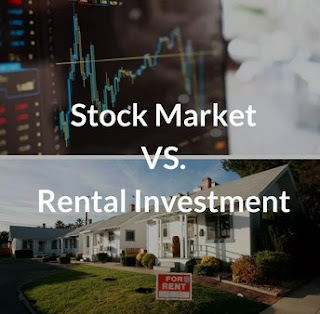 In this two-part article, we will compare stocks to rental properties, focusing mainly on security (part 1) and typical returns (part 2). Part 1: Stocks are subject to changing market conditions, complex regulations and economic policies.' Past companies once regarded as titans in their respective industries can now be found in the bargain bins of stock exchanges. Sears, the once the dominate player in mail order catalogs and department stores fell victim to the big-box retails, who now battle existence with the E-Commerce business. CD stores, once a staple at every mall, permanently rolled down the store-front grills as consumers chose digital formats as their preferred music medium. Risking lending, ridiculous loan products and extreme leverage forced century old financial institutions into bankruptcy and federal bailouts. Detroit, once a symbol of American manufacturing featuring the 'Big Three' is now a city in decline as a result of overseas competition, and rising manufacturing costs. In contrast, the federal government provides housing-friendly regulations, tax incentives and programs as it views housing as the American dream and vital to the economy. The rental industry is not a commodity, but rather a necessity as it provides one of mankind's most primitive needs: shelter. Historically, housing has maintained a steady appreciation. The median home price from 1940 to today has increased from $30,600 (adjusted for inflation) to $234,000. However, real estate is not immune to losses. For the first time since the great depression, housing saw widespread property losses. Despite these losses, rents maintained and provided a life raft for landlords to weather the storm. What started as a disaster, became the biggest buying opportunity in decades for landlords. A company's stock performance can be directly impacted by the board of directors and by CEO decisions. For example, in 2000 Blockbuster chose not to buy a new capital-strapped company called Netflix as it feared Netflix would cannibalize its core industry. Enron once a blue chip and must have in many mutual funds collapsed as a result of massive deceptive fraud. As a landlord you are solely responsible and knowledgably of all the financial handlings and deception is impossible. As the Dow Jones Industrial average (a stock index consisting of 30 companies) continues to break records, it is important to note, not one company has remained on the index since its inception in 1897 and many recent members have received federal bailouts or filed for bankruptcy.